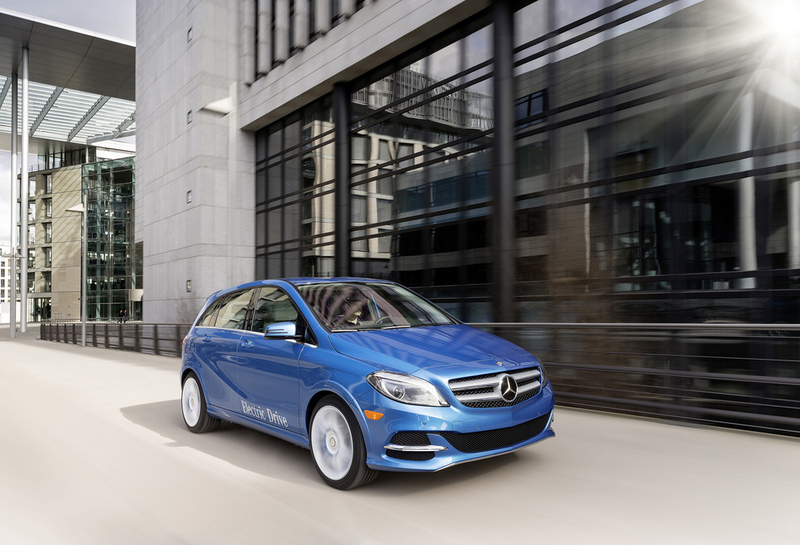 The all-new 2014 Mercedes-Benz B Class Electric Drive is the latest in growing list of compact premium electric vehicles hitting the U.S. market. The B-Class Electric Drive, which is making its world debut at the New York International Auto Show, is powered by an emissions-free high-torque electric motor with an estimated range of around 115 miles (200 km). The EV, the first luxury battery-powered electric car from Mercedes-Benz in the U.S., features an electric motor with more than 134 hp (100 kW) and a maximum torque of 228 lb.-ft. For the standard sprint from 0 to 60 mph (100 kmh), the electric-powered B-Class requires less than ten seconds. The lithium-ion battery is stored in what Mercedes-Benz calls the “Energy Space” in the vehicle’s underfloor to allow for more interior space in the car. The B Class Electric Drive’s maximum speed is electronically limited to 100 mph (160 km/h) with a driving range of around 115 miles (200 kilometers). The car’s battery can be recharged at any standard domestic power outlet. In the USA, the estimated charging time for a range of about 60 miles (100 kilometers) is less than 2 hours at a more powerful 240 V/40 Amp outlet, the same kind you plug a clothes dryer into. Even cooler, the driver can access his vehicle through the internet, using a PC or smartphone to check the current charge status of the battery or to verify the vehicle’s current range on a map. The planned route can also be displayed, immediately showing whether and where the vehicle can be recharged along the way. The car’s major selling point for consumers, however, will likely be the cachet associated with the Mercedes-Benz badge, which the brand seems to have worked intensely on maintaining in every facet of the vehicle. “The B-Class Electric Drive meets the wishes of many customers for emission-free driving without foregoing the hallmark attributes of a Mercedes-Benz, namely: safety, comfort and, of course, not to forget exhilarating driving pleasure,” said Dr. Joachim Schmidt, a member of the Mercedes-Benz Cars Board of Management responsible for Sales and Marketing. Based on the conventionally powered popular B-Class sold outside of the US, the new B-Class Electric Drive features many of the Mercedes-Benz design elements – most importantly, the brand’s prominent front grille and badge. The interior of the car features many premium Mercedes features like high-quality materials and a standard Audio 20 system with a 14.7 cm color screen, a twin tuner, an MP3-capable CD player and a USB connection. The B-Class Electric, which goes on sale in May, is also available with Mercedes’ multimedia system COMAND Online with internet access, navigation and voice control as an optional extra.